This day the plan was to play the intersection of the dry line with whatever leftover outflow boundaries from the previous day there were. There was plenty of CAPE available from southern Oklahoma down to I-10 in west Texas, but upper level flow was limited and the shear profile was not very good. The morning models showed two primary target areas: along a line from Wichita Falls, TX down to around Throckmorton, which was the area where the severe parameters appeared to be best, or just south of Abilene, where the models broke out an isolated storm in an area with very high updraft helicities. We initially targeted the Abilene area, but soon adjusted to a more central location that would allow us to play either target. Starting from Weatherford, TX, we stopped in Cisco for lunch and to wait for initiation. We hung out in Cisco for an hour or two before storms started to pop to our northwest over Newcastle. With the Abilene area still quiet, we decided to head north to intercept. As you’d expect in a high-CAPE environment, once the storms initiated the updrafts went up quick and soon we had targeted a storm forming just north of Breckenridge. We headed northeast out of town on Rt. 67 and stopped on FM 1800 near a correctional facility and watched the nicely structured classic supercell as it grew from its infancy, though we had to move at one point because the prison perimeter guard came out and told us we were too close to the prison! I guess four unmarked white vans sitting within view of the prison fences made the guards nervous! We watched from our new vantage point up the road for another 30 minutes or so as the storm matured, grew an inflow band, and quickly developed a nice blocky wall cloud that soon was rotating rapidly. The storm was also highly electrified and at one point we were forced back into the vans to reduce the lightning threat. The hail roar from the storm was loud and constant all throughout our time chasing it. Low level shear may have been a problem though and the wall cloud never tightened up, and we soon headed back to Rt. 67 to stay with the storm as it moved east. As we headed back south though, the storm had cycled its wall cloud and now looked like it could tornado right over the road, so we quickly zoomed back north right up to the mesocyclone which had wild cascading motion as it crossed right in front of us. Unfortunately, it couldn’t focus though and soon the meso jumped and the new area of focus was to the east, so we headed back south, then east, in pursuit. Road options were fairly limited, so we had to follow Rt. 180 for about 16 miles east before we could turn north again at Brad, which put us well out ahead of the storm as it was not moving very quickly. In the meantime, the storm had merged with a cell north of it and cycled back up. We set up on Rt. 16 and waited for the storm to arrive. The storm was now morphing into a high-precipitation supercell and had 3 distinct hook echoes on the southern side as it approached. The storm was turning right hard and dive bombing southeast so we got clipped by the front flank core a little before the inflow notch became visible. As it did, a dark cone/elephant trunk funnel developed off in the distance! From our vantage several miles away we could not tell if it was on the ground or not, but later pictures from chasers who were closer confirmed that it was indeed a tornado! It was the 5th one of the trip, albeit a very brief one. With the storm expanding and closing on our position we had to leave to get back out in front of it. We headed southeast from Brad and through Metcalf Gap, and terrain now was becoming an issue on top of the poor road network since we were now passing through a series of valleys surrounded by high terrain. We continued northeast on Rt. 180 then south on FM 919, eventually finding a good vantage point to watch the now monstrous HP storm come at us. The dark turquoise color meant big hail, and the storm was surging towards us, so we couldn’t stay long and soon once again lightning was pinging all around us. Since the storm was now HP and the rotation was completely engulfed in the core of the storm, there was no hope of seeing a tornado, even though we knew there likely was one in there (there was, and the storm went on to produce one or two more rain-wrapped tornadoes), so we decided to target a new storm which was finally developing down near Abilene. Just can’t take vans filled with guests into the hook area of an HP storm! We headed down to Gordon and hopped on I-20 towards Baird, targeting a maturing, anchored storm near Ballinger, but the first order of business was to get out of the way of our original storm, which was now crossing the highway. We got clear of that storm and dropped south out of Baird, heading all the way south to Coleman before turning west towards Ballinger. Unfortunately, the storm was struggling after a split and dying. We decided to get south of the storm by punching through the slimmest part of the core on the south flank and did so, heading towards Paint Rock as big cloud-to-ground lightning bolts hit all around us: Another highly electrified storm, this was a big year for lightning! Sadly other than torrential rain and high winds from the outflow, the storm was dying quickly and soon we turned around and gave up, heading up to Abilene for the night. Another day, another fun chase of a great supercell, and another tornado, although it was a brief one. Mileage for the day was 397. 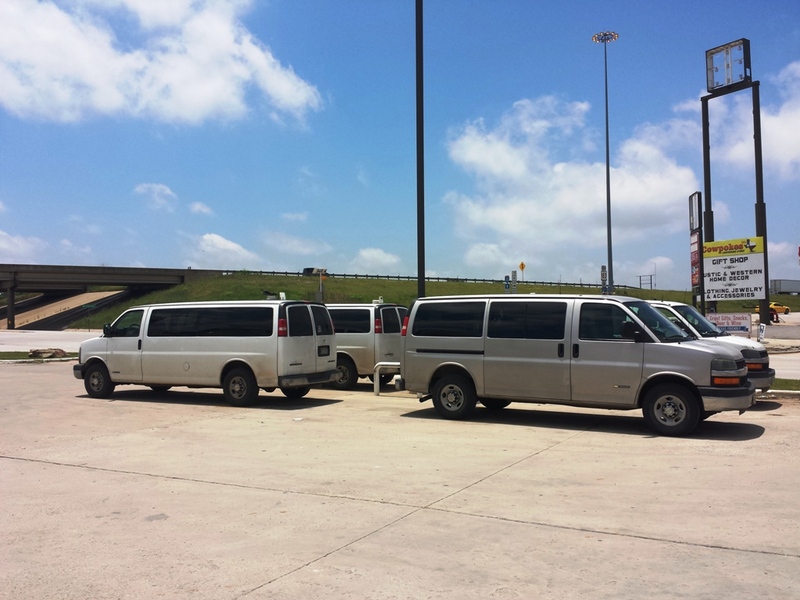 The vans arrayed in defensive formation in Cisco, TX. We stopped near a prison in Breckenridge, TX to watch a rapidly developing storm. The locals want to know what's going on. Developing updraft over the correctional facility to our west, getting sheared over. Crisp anvil passing overhead. Flanking line development as the storm moves to our northwest. nflow tail peaking out from the front flank core. Mature classic supercell structure. In a high CAPE environment like this, the storm matures very quickly. Nice developing wall cloud. Broadening out, the wall cloud was rotating hard. Nice broad base as the storm passes to the north with a "nose down" wall cloud. Closer view of what is now a developing "collar" cloud. Cycling up again as the storm passes due north, we loaded up to pursue! Back on the main highway, the storm crosses the road to the north with 2 action areas. The old meso east of the road. And the new one right over it. To head east and stay with it we had to follow a road that took us away from the storm, but that allowed a better look at the whole structure. It took a solid 30 minutes to get around and out front, by which time the storm was going HP. Here it comes! Tornado! Note the funnel in the distance. Unfortunately this was as close as the roads would allow us to get but it was confirmed. Higher contrast to bring out the tornado a little. The anvil stretching WAY off to the east.